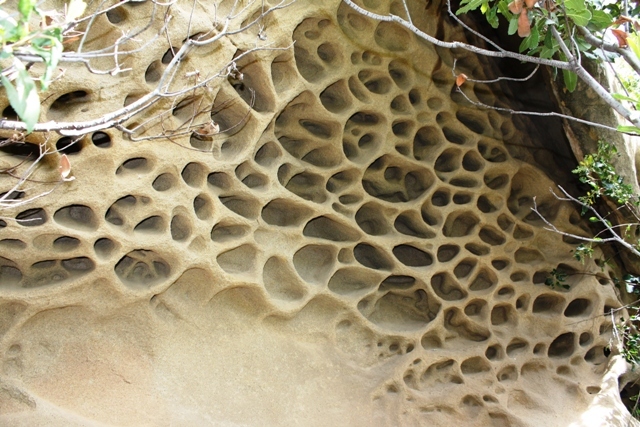 Tafoni formations on Pool Rock. So reads the opening lines of the obituary for John Haines in a 2001 edition of the New York Times. In his essay “Moments and Journeys,” wherein he reflects on his Alaskan experiences, Haines tells briefly of a hike he took to Pool Rock, a Chumash Indian rock art site in the remote Santa Barbara County backcountry. Pool Rock, a sandstone monolith resembling a massive molar tooth, takes its name from a broad concavity on its topside which fills with rainwater. A shallow fire-blackened cave along its base is decorated with Chumash pictographs, petroglyphs and cupules and holds several bedrock mortars. It is a spiritual place of mystery and silence, where on any given afternoon the occasional caw of ravens soaring overhead and gusts of wind blowing through the chaparral are the only sounds to be heard. “One December day a few years ago, while on vacation in California, I went with my daughter and a friend to a place called Pool Rock. We drove for a long time over a mountain road, through meadows touched by the first green of the winter rains, and saw few fences or other signs of people. Leaving our car in a small campground at the end of the road, we hiked for miles up a series of canyons and narrow gorges. We lost our way several times but always found it again. A large covey of quail flew up from the chaparral on a slope above us; the tracks of deer and bobcat showed now and then in the sand under our feet. An extraordinary number of coyote droppings scattered along the trail attracted our attention. I poked one of them with a stick, saw that it contained much rabbit fur and bits of bone. There were patches of ice in the streambed, and a few leaves still yellow on the sycamores. We came to the rock in the mid-afternoon, a great sandstone pile rising out of the foothills like a sanctuary or a shrine to which one comes yearly on a pilgrimage. There are places that take on symbolic value to an individual or a tribe, “soul-resting places,” a friend of mine has called them. Pool rock has become that to me, symbolic of that hidden, original life that we have done so much to destroy. We spent an hour or two exploring the rock, a wind and rain-scoured honeycomb stained yellow and rose by a mineral in the sand. Here groups of the Chumash Indians used to come, in that time of year when water could be found in the canyons. They may have come to gather certain foods in season, or to take part in magic rites whose origin and significance are no longer understood. In a small cave at the base of the rock, the stylized figures of headless reptiles, insects, and strange birdmen are painted on the smoke-blackened walls and ceiling. These and some bear paw impressions gouged in the rock, and a few rock mortars used for grinding seeds, are all that is left of a once-flourishing people. This entry was posted in Santa Barbara County and tagged Archaeology, Chumash, Hiking, History, Indians, Petroglyphs, Photos, Pics, Pictographs, Rock Art. Bookmark the permalink. Awesome! Would love to see more pics of the petroglyphs.